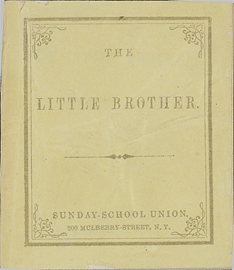 The Sunday School Union of the Methodist Episcopal Church was located at 200 Mulberry St., New York between 1860 and 1869. Wood-engraved frontispiece is the only illustration. First sentence: "Harry Stone was seven years old." Copy in McGill Library's Rare Books and Special Collections: yellow wrappers. I. Mackenzie. Montreal. May/62. $20.00 (for set of 11). Given to McGill 2001.
text.chapbook.black and white, 66 x 57 mm.